One year of Cosa mi metto??? - The party | Cosa Mi Metto??? Hey girls, how are you today? These are all the photos taken during the party. The post is a little bit long but I want to give to all my friends the chance to find them in the pics! The amazing dress I was wearing is from Axparis, the earrings and the bangles are from Byba Bijoux, the ring is from Lotus Mendes and the gold heels are from Balenciaga. Enjoy the shoots! Hey ragazze, come state oggi? Queste sono tutte le fotografie fatte durante la festa. Il post è un pò lungo ma volevo dare ai miei amici la possibilità di ritrovarsi nelle foto! Il fantastico vestito che indossavo è di Axparis, gli orecchini e i bracciali sono di Byba Bijoux, l'anello è di Lotus Mendes e i sandali dorati sono di Balenciaga. Godetevi gli scatti! Ma anche le tue amiche sono fashion blogger????? Complimenti per tutto e continua così!!! No non lo sono, ma anche loro amano la moda! Che bella la torta! Moolto carino il tuo abito! post.. nuova illustrazione! Vi aspetto.. Very charming smile!) Fantastic look! Menuda fiesta, se nota que lo pasasteis genial!! Hi darling !! congratulations!!! nice photos and great party!! I hope you can celebrate much more years and I hope I can see it !!kisses!! Congrats! and happy first blog birthday!! you look fab on that dress! and what a lovely party!! You look beautiful and perfect!! Pics are great! Cakes look delicious! the party looks so so fun! congratulations! your dress looks fabulous. beautiful cake ( torta ) !!! Il tuo vestito è un'incanto!!! Ciaoo graziee della visita.. ti seguo da abbastanza tempo fa eheh.. bellissime le foto davvero.. sono stupende.. Un abbraccio dalla spagna.. Ciao e buona giornata..Bacii!!! ..tu eri a dir poco raggiante! Bellissimo l'abito e bellissime le tue amiche accipicchia!!! Tu e tuo marito siete una bellissima coppia! fantastic pictures. i love your dress. you look gorgeous. congrats to your first blog-birthday. i like your blog so much, you make an excellent job. lovely greets and kisses to you! if you have time, visit me. How cool that you threw a party for you 1 year's anniversary! The cake looks so cool! io non ho capito per cos'è stato il party...per un anno del blog? Si, è stato proprio per festeggiare un anno del blog! I would love to follow you on twitter and Bloglovin.I do now,waiting for you to do the same. wow .. ma che bella festa! tu sei fantastica .. questo vestito è stupendo! tutti bellissimi comunque .. auguri ancora! Congratulations. Your dress is gorjus. Congratulations! it is a grand party! amazingly beautiful cake! you look great! you are beautiful! I am delighted with your blog! Congratulazioni!! Hai un blog bellissimo e il tuo vestito è un incanto!! PS. Ti seguo con piacere, spero ricambierai. Bella la festa , la torta e sopratutto tanto bella tu ! That's a really impressive party, I hope you guys had a blast. Dev'essere stata una serata divertente!! Belle foto!! how super fun is this!!!! love your photos and your dress is to die for! wauw you're beautiful and your dress is soooo stunning ! You look so beautiful, I especially love your earrings!! Congratulations! :) Lovely photos :) Sure looks fun! I would have liked to have them in black but there was more my size. BEAUTIFUL! I love your dress! I love your blog, so I follow you now! Hi dear..Thanks for your comments on my blog.. I follow you now and you? 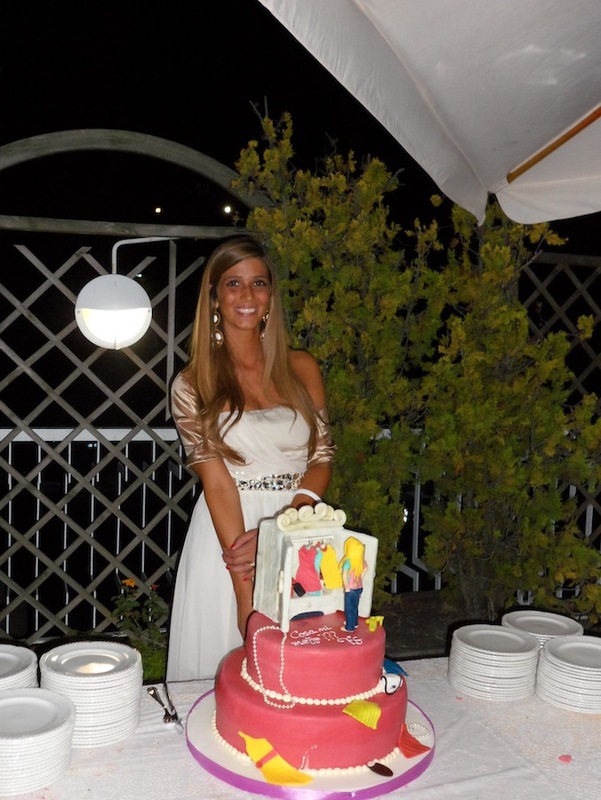 Che bella festa e anche la torta hai fatto! Stai benissimo con il vestito bianco!! ahh this looks like so much fun!!!! I'm following you right now on Google Friend Connect & Bloglovin. hope you can follow me!!! Looks like an amazing night and you look fabulous! And that cake!! so adorable! You asked me to follow, but I already follow you with GFC... Love your pictures, seems like you had a lot of fun!! How fun! You look great!! What a cute cake....Happy one year anniversary! It looked like a fabulous party too! Congrats on the one year:) The party looked great! Congrats on one year of sharing your fabulous style!Many many more ahead! Wauw, you look so pretty! Looks like an amazing party! ed ora sono diventata follower! Ma che splendido vestito!!! *_* Stavi benissimo, complimenti! What a beautiful party ! Yours photos are great, and your dress too ! Thank you really much for your comment :) .. And happy birthday ! You are beautiful and your cake is so yummy! Congrats on the one year, your dress looks fabulous. tu sei divina con quel vestito!!!! By the way, the cake is so cool! Congrats dear! you looked stunning! What a lovely event. You look gorgeous, and you have gorgeous family and friends. Hey lovely girls, thank you so much for all your compliments!!! Hey dolcissime ragazze, grazie mille per tutti i vostri complimenti!!! Happy Belated Birthday to coa mi metto!! Looks like it was a fabulous party!! Love the cake, so cute. Wow what a beautiful seeming night! The cake is totally cute! Only 1 year of your blog? I am approaching one year next month and I am not yet even at 150 followers. You found my blog early on and I am wondering if you have any tips to share with me for growing. I would much appreciate it! Anyway, congrats! And I wish you continued greatness! Very beautiful people!!! Great celebration!!! Congratulations dear! Love you, Love your blog!!! Congrats to your blog-birthday! Your outfit was fantastic and it looks like you and your friends had a great time! This is soooo fabulous!! What an awesome idea to celebrate your blog birthday! I love your style and love visiting your blog.